While focusing on the remains of an exploded star roughly 10,000 light-years away, a team of Japanese astronomers have stumbled across a mysterious cloud of molecules tearing through the Milky Way. So quickly, in fact, they've nick-named it the unknown phenomenon the 'Bullet'. The cause of this cloud's ridiculous speed isn't clear, but so far all signs suggest it's been sent hurtling through space thanks to a rogue black hole. On account of their light-sucking talent, black holes aren't known for being all that easy to spot. They sometimes reveal themselves by stealing material from a nearby star, heating it up and forcing it to emit X-rays. If they're wandering alone in interstellar space, however, they tend to remain hidden. Yet in this case, the shadowy influence of a black hole could explain why a cloud of molecules 2 light-years in size was moving forward at 120 kilometers per second (75 miles per second), and expanding at 50 kilometers per second (31 miles per second). Weirder still, it was moving against the direction of the Milky Way's spin. The astronomers from Keio University in Japan used the 45 meter (148 feet) Radio Telescope at Nobeyama Radio Observatory and the ASTE Telescope in Chile to study the cloud's surrounding supernova remnant W44. They were interested in how energy from the supernova transferred to the surrounding gas. What they saw was a cloud which moved faster than could be accounted for by the supernova alone. "Its kinetic energy is a few tens of times larger than that injected by the W44 supernova," says lead researcher Masaya Yamada. In spite of what the Alien movies might tell you, sound can technically move through space if there's plenty of energy and a high enough density of particles. Yet even within clouds of gas and dust, this particle density is far, far lower than on Earth, so waves spread pretty slowly. 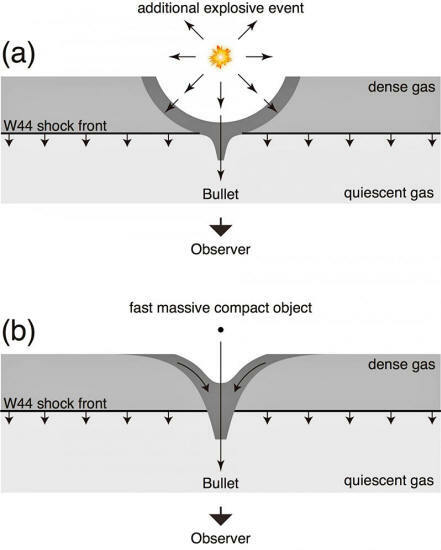 The 'Bullet' exceeds this speed by at least two magnitudes, making it a truly supersonic space cloud. The researchers have proposed two scenarios to explain their observations, both of which require a black hole. In the first scenario, a rapidly expanding cloud of gas pushed by a stellar explosion would pass over a black hole sitting quietly, minding its own business. This black hole would only be about 3.5 solar masses in size, just big enough to pull the cloud over it, accelerating it to the observed speeds. Scenario number two would require a black hole 10 times bigger. This monster would punch through the cloud as it zoomed through, dragging the cloud in its wake. Given the current sets of data, it's hard for the team to decide which scenario is more likely. Higher resolutions of the cloud using better telescopes, such as the Atacama Large Millimeter/submillimeter Array in northern Chile, could provide more clues. Either way, the astronomers are excited by the possibility of having a new method for spotting elusive black holes lurking in the quieter corners of our galaxy. 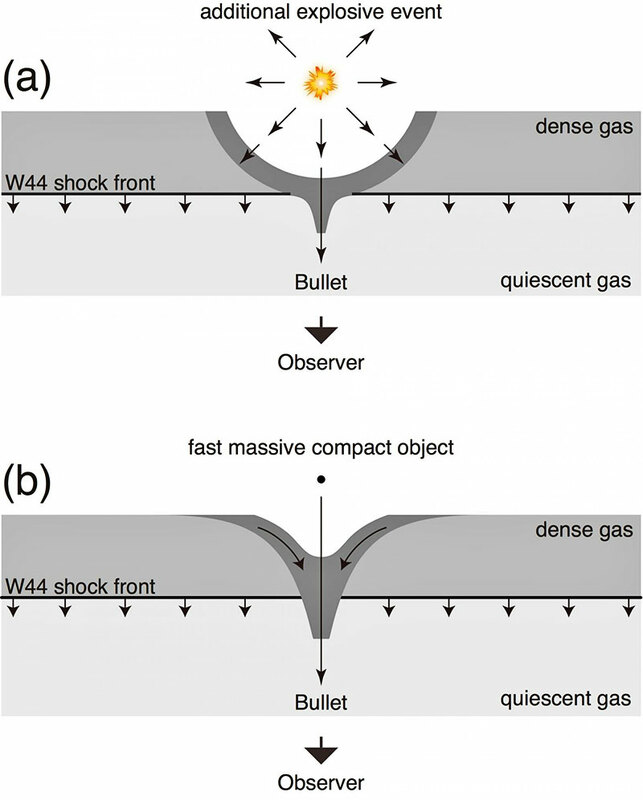 This research (Kinematics of Ultra-High-Velocity Gas in the Expanding Molecular Shell Adjacent to the W44 Supernova Remnant) has been published in Astrophysical Journal Letters.